I was not feeling particularly led to cook anything today. Not really. I already have a couple sets of leftovers from the few previous meals I’ve cooked – all of them delicious – and there really isn’t a need. There’s that, and there’s also the fact that I’m still making my way through my self-imposed fruit and vegetable desert. When you can’t cook what you really want, the desire to cook is somewhat diminished. But… I figured since this is still a budding little blog, it would be a good idea to do something. So I thought, what can I cook that requires the least effort, but will still be worth sharing with all of you. 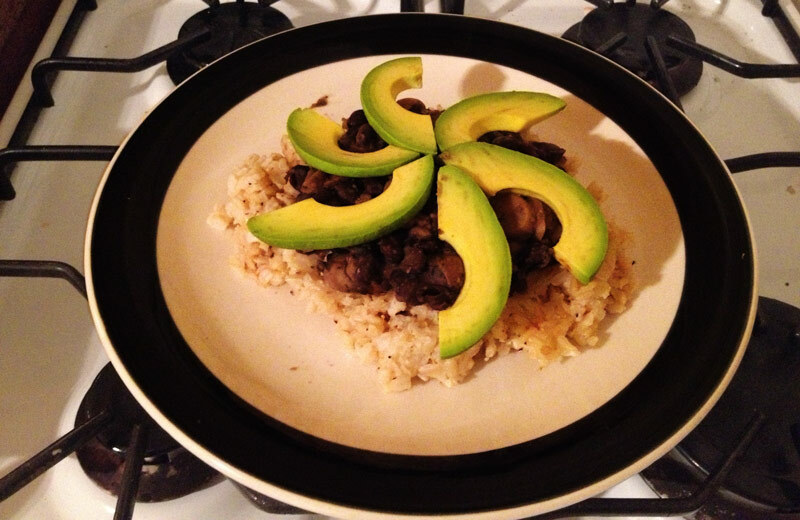 Long story short, I cooked up some black beans and rice with avocado & mushrooms. It was alright, but it wan’t great. I plated it and tried to make it look nice and pretty, and honestly, for as simple as it was, it tasted pretty good. But the reality is, when all you really want is a bowl of fruit loops & milk, a plate of black beans & rice really doesn’t do much. You know? So I finish my meal and get on my computer to check email and I see that one of my fellow food bloggers has posted a new recipe. I like to see what other cooks in the bloggosphere are up to, so I checked it out. Given the disappointing experience with tonights dinner that I just recounted, this was a poor decision. I click on the link to go to her blog, and she has posted a recipe – with pictures – of Red-Lobster-style cheddar biscuits! WITH PICTURES!! Oh my word! I thought my beans and rice didn’t measure up to fruit loops. Put it up against those lumps of baked cheesy goodness, I might as well be eating mud. Anyway, now that I’ve really sold you on MY creation, if you’d like to try it out for yourself and draw your own conclusions, you can find the recipe in the recipe’s section of the blog.